​The Unite 4 Peyton Foundation was established with a hope, wish and a dream. We wanted to help, in what seemed to be a helpless diagnosis for many families . We wanted to make a difference in the lives of those diagnosed with Spinal Muscular Atrophy. We wanted to make a change. In 2008, Peyton was diagnosed with this devastating disease. No one in our family had ever heard of SMA. The doctors gave us the diagnosis, their sympathies, and send us home. Now what?? We turned to the internet, the source of all information the world has to offer- both good and BAD. After several hours of pouring thorough medical websites, personal SMA family pages, memorial sites to those children that had passed with SMA, the tears could not stop flowing from our eyes. It seemed that even with the best medical teams in the world, there was no hope. 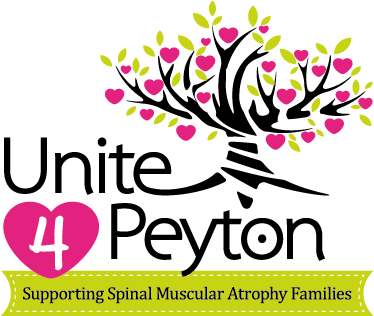 Unite 4 Peyton was created to give Hope to Spinal Muscular Atrophy families. We know that we can not find the cure ourselves, but we can help children and families maintain a quality of life. By provided necessary medical equipment, learning devices, home modifications, or helping cover travel expenses to and from medical appointments and hospital stays. We are here as a support system for SMA families, because we know from first hand experience how scary this disease is and can be.